So it turns out Roger Waters is not the only Pink Floyd member who needs an education. 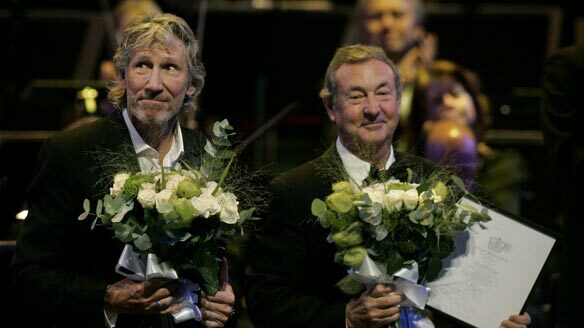 Drummer Nick Mason has co-authored a piece with him urging The Rolling Stones to reconsider performing here. With the recent news that the Rolling Stones will be playing their first-ever concert in Israel, and at what is a critical time in the global struggle for Palestinian freedom and equal rights, we, the two surviving founders of Pink Floyd, have united in support of Boycott, Divestment, and Sanctions (BDS), a growing, nonviolent global human rights movement initiated by Palestinian civil society in 2005 to end Israel’s occupation, racial discrimination and denial of basic Palestinian rights. The BDS movement is modeled on the successful nonviolent movements that helped end Jim Crow in the American South and apartheid in South Africa. Indeed, key figures who led the South African freedom struggle, like Archbishop Desmond Tutu and Mandela’s close associate, Ahmed Kathrada, have come out in support of BDS for Palestinian rights. BDS offers us all a way to nonviolently pressure the Israeli government to fully realize that its injustices against the Palestinian people are legally and morally unacceptable and unsustainable. The movement does not advocate a particular political framework — one state or two — and neither do we. Rather, we call for a resolution that upholds freedom, justice and equal rights for all, irrespective of identity, and does not cause additional suffering for either people. We are nearing the tipping point in global awareness that the denial of Palestinian rights has had a devastating impact on generations of people, and that they need our support now more than ever. Consequently, we encourage you, fellow artists, to ask yourselves what you would do if forced to live under military rule and discriminatory laws for decades. If the answer is that you would resist until justice prevailed, we ask that you champion BDS as a nonviolent, collective means of securing a better future for all. 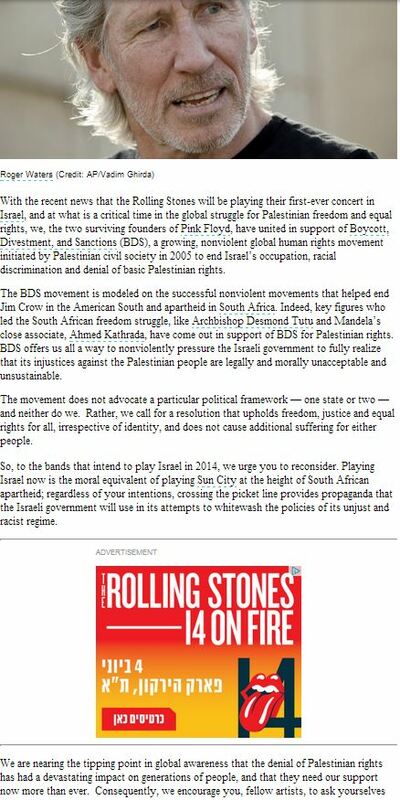 If you wouldn’t play Sun City, back in the day, as you, the Rolling Stones did not, then don’t play Tel Aviv until such time as freedom reigns for all and equal rights is the law of the land. Besides the usual “arguments”, notice they claim the BDS movement “does not advocate a particular political framework – one state or two.” This might be their carefully worded official position, but in practice, they regularly let down their guard. And I’m not just talking about mere BDS protesters but rather higher-ups. Heck, even Norman Finkelstein has come out and lambasted the BDSHoles for this. Here’s hoping these two ignoramuses get no satisfaction from the Rolling Stones. Update: You have to love Google ads.